How to create a test certificate for myself using the "makecert.exe" command? You can create a test certificate for yourself using "certmgr.exe -n" command as shown in this tutorial. 2. Double-click on the output certificate file, "fred.crt". You see general information of your certificate. Generated a pair of private key and public key first with the default algorithm. 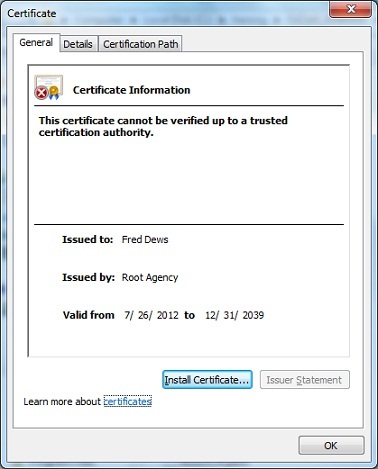 Signed the public key by the system default root CA: "Root Agency" into a certificate for "Fred Dews". Stored the certificate in a certificate file "fred.crt". The private was not attached to the certificate. It was stored somewhere else by the system.